Your Danube River cruise delights with gorgeous views, beginning in Budapest, the "Pearl of the Danube." Enjoy guided sightseeing, including the iconic Heroes Square and spectacular architecture. You’ll sail on the Danube River to the centuries-old Slovakian city of Bratislava. Take a guided tour of its cobblestone streets and gothic cathedral, and consider hiking with your Avalon Adventure Host to lofty Bratislava Castle. 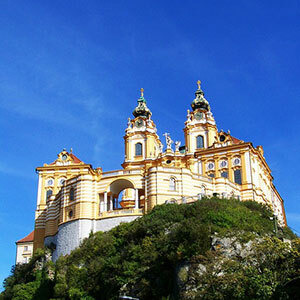 Next, cruise to marvelous Melk for guided sightseeing in Austria’s Wachau Valley, including the magnificent Benedictine Abbey perched above the Danube. In Dürnstein, join a guided hike above the famed blue Stiftskirche steeple for breathtaking views.